This is a sandwich you can believe in. 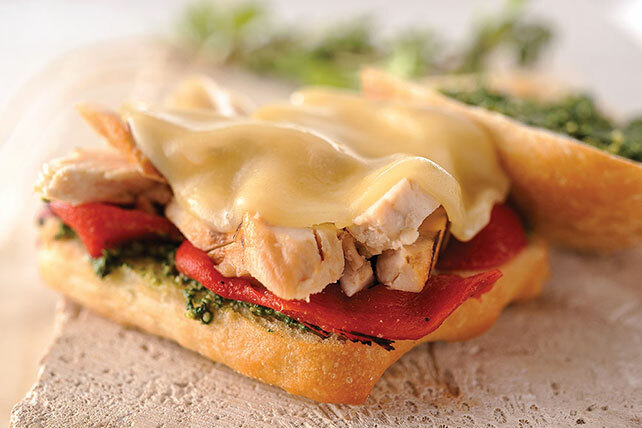 In just 5 minutes, you'll be enjoying cheesy chicken paired with pesto and peppers on a crusty roll. Mound chicken on microwaveable plate; top with cheese. Microwave on HIGH 30 sec. or until cheese is melted. Meanwhile, mix mayo and pesto; spread onto cut sides of roll. Fill roll with chicken and peppers. Substitute 2 Tbsp. KRAFT 2% Milk Shredded Mozzarella Cheese for the provolone cheese slice and use KRAFT Light Mayo Reduced Fat Mayonnaise. Substitute 1/4 cup sun-dried tomatoes for the roasted peppers. Prepare as directed, using grilled fresh chicken strips and 2 Tbsp. KRAFT 2% Milk Shredded Mozzarella Cheese.